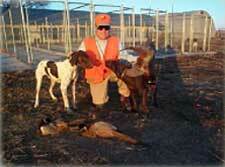 Hole N' The Wall Lodge provides the perfect habitat for wild Ring Neck Pheasant hunting in Iowa. Located in the far Northern reaches of Iowa's famous Loess Hills, Hole N' The Wall Lodge provides a beautiful setting that is the perfect blend of Iowa farm ground and upland game birds preferred hills. This setting may be the perfect habitat for the wild Ring Neck Pheasant in North America. The wild bird season starts from the last week in October through almost the second week in January according to Iowa DNR regulations. Our lodge is comprised of two main areas, the main lodge and the West Wing. We are security monitored inside and outside with surveillance equipment for our protection and yours. The main lodge is a 3-story "built to look old, state of the art high-tech facility". It is smoke-free and handicap accessible. The West Wing is a smoke-free, 3-story, 4 bedroom house with 2800 sq. ft. The lodge features 3 king beds and 1 queen loft area. All guest rooms have private baths, plasma televisions with Dish Network, phones, alarm clock, high-speed Internet, full kitchen, laundry center, central heat and air conditioning. The Loess Hills Preserve is a hunting preserve expanding over 900 acres of the beautiful Loess Hills of Northwest Iowa. This secluded preserve offers some of the finest pheasant hunting within a natural wildlife habitat. Take aim and improve your shot with our tower shoot, available with our preserve and combo hunting packages, or all on its own. For more information on available dates and price quotes go to the Shiloh Farms Hunting web site below. To book a hunt now call: 712-540-3344 or E mail.